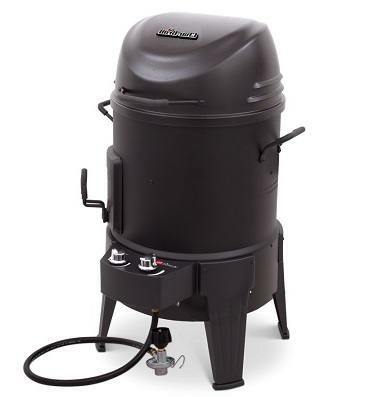 Pellet smokers have been gaining in popularity since the 80's, and they have evolved and improved dramatically over the years to become the premier backyard meat-smoking devices they are today. In fact, pellet smokers are the easiest smokers to use, being thermostatically controlled with digital temperature displays and feeding instructions to guide you. Most modern smokers are great buys, but finding the best pellet smoker can be tricky, that's why we have prepared a ultimate guide with the best pellet smoker reviews and other information needed to pick the best possible option. #1 - The T﻿raeger 155.01 BBQ is a moderately compact grill at 292 inches of cooking surface and with dimensions of 21 x 23 x 21 inches. It cranks out 19.5 thousand BTUs and comes with a mid-ranged price tag. Great for small to mid-sized smoking endeavors of all kinds and can be had in a special tailgate version. #2 - The Char-Broil Big Easy TRU-Infrared is a low-priced alternative that still gives you all the basic features you need for quality smoking and grilling. It offers 180 square inches of grill surface, including the upper story of the double-stack rack, and has dimensions of 36 x 18 x 24. It ranges from nine to 18 thousand BTUs. #3 - REC TEC Wood "Smart" Grill is quite possibly the best pellet smoker grill on the market today. Its size at 48 x 57 x 34 inches and a cooking zone of over 700 square inches give you room to smoke a veritable smorgasbord all at once. It has "smart grill" technology and all the perks. The price is on the high end, but then, so is the value. #4 - Camp Chef PG24 Pellet Grill and Smoker is mid to upper tier and is an extremely good bargain for what you get. It measures 51 x 21 x 45 inches and offers 429 square inches of grill space plus 144 additional square inches on the removable upper rack. It has very good temperature control, efficient wood use, and an easily cleaned out ash box. #5 - Pit Boss 71700FB Pellet Grill with Flame Broiler is a mid-sized grill at a mid-sized price and with mid-tier smoker features. Its dimensions are 44 x 27 x 41 inches with 700 square inches of grill space. It weighs about 120 pounds and has a 10-pound pellet hopper. The BBQ 155.01 by Traeger has many special features that help it to hold its own in crowded and competitive field. At 19,500 BTU capacity, it is fairly powerful and has a maximum operating temperature of about 450 degrees Fahrenheit. It also sports a stylish bronze-finished lid and black steel body, automatic auger, auto-start function, and digital control. You get a respectable 292 inches of cooking surface space, dimensions of 21 x 23 x 21, a fully portable 71-pound unit, and a 10-pound pellet hopper. Most will want the Junior Elite version of this smoker-grill, but a Tailgater version with fold-down legs also exists and serves a useful purpose for those who like to combine the grilling and gaming life. The Traeger BBQ 155.01 is not really big enough to smoke a sizable turkey, but anything smaller it handles superbly. It comes with a digital thermostat that greatly simplifies the smoking process and guards your precious meat from overcooking. This smoker and grill more than adequately meets the great majority of your smoking needs and comes at a mid-ranged price for a great value. The Big Easy TRU-Infrared Smoker is an upgrade on the earlier Big Easy, giving you the benefits of quick, easy, and even throughout infrared cooking. The meat will not dry out, and you can cook a wide variety of meats, within the limited space. You get 180 square inches of grilling surface in a 36 x 18 x 24 inch unit. This includes the innovative double-stack roasting basket. The unit weighs only 52 pounds and can hold up to 25 pounds of meat. Cooking power ranges from nine to 18 thousand BTUs. The smoker box in the side lets you add smokey flavor to your meats and works just as well with wood chips. No air damper or water pan is required to keep the meat moist, there is no spit rod to worry about balancing, and no oil or charcoals need be supplied to keep it running. The upper scale Traeger Grills Lil Tex Elite 22 Grill is a good family size grill. No need to heat up the kitchen during the summer. The Lil Tex is 49" high x 42" wide x 22" deep, weighs 98 pounds, has a 418 square inch cooking capacity, and holds 18 pounds of wood pellets. It has a food capacity of 16 hamburgers, 24 hot dogs, four racks of ribs, or four chickens. This is enough to feed your family no matter how hungry they are. The Lil Tex uses wood pellets for better flavor and provides the same six cooking methods as the other grills made by Traeger Grills. It also offers the electronic auto-start, Integrated Digital Elite Controller for consistent temperature, the high and fast or low and slow barbecuing, and the easy-to-clean porcelain grill grates. This means that this grill is so easy to use and clean that you won't mind using it for your family every night. The durable steel frame has the powder-coated finish and is equipped with sturdier legs and two wheels. The PG24 from Camp Chef is not quite the star of the pellet smoker world as the Traeger options just covered above, but it may be the best value dollar for dollar. It still requires a good investment, not nearly so much as some other high-end products, but still has a large number of top-tier features packed into it. The dimensions are 51 x 21 x 45 with 429 inches of grilling surface, 573 if you factor in the detachable upper grill rack. The unit is of solid steel build and weighs in at around 125 pounds. You get both a build-in digital meat probe and internal temperature sensor, along with an LED digital display. The hopper holds 18 pounds of pellets and uses them very conservatively. The ash can can be cleaned out via a patented system that eliminates the need to take the grill apart to clean it. Among other beneficial features are auto-ignition, auto shutdown, and a spacious side shelf. Pit Boss's 71700FB is mid-tiered model in a few ways when comparing with other products on this list. It has dimensions of 44 x 27 x 41 inches and it is also priced in the middle-range group of this list, which is a bit less than the comparable Traeger smoker reviewed above. You do get 700 square inches of cooking surface, including a second-level rack, combined together should be more than enough cooking space for the average consumer. The burn system is digitally controlled and the grill plates are of porcelain-coated cast iron, making it very easy to set and reach the desired cooking temperature. Most of the build material used on this product is of heavy gauged steel, and the hopper holds up to 10 pounds of pellets. This is a great, overall well-build product with a few simple features and plenty of cooking space, all priced on a very reasonable price. We see the Traeger Lil Tex 22 Grill as the clear winner of our best pellet smoker contest. It costs the most of all contenders but has the best temperature control, consumption efficiency, and grilling space. The Lil Tex 22 offers little room for improvement with its ease of use, wide range of grilling options, and easy portability via roller-blade-like wheels. If there were a number two placer and a more best cheap pellet smoker , it would clearly be the Traeger BBQ 155.01, for its great "features per dollar" ratio and its easy clean-out ash can.